The Maya, in addition to their numerous scientific, astronomical, and cultural discoveries, also dedicated part of their time to artistic representations, mainly rituals and ceremonies that brought together dance and theater. Dances and songs dedicated to the gods were performed with feathers and jewels, masks, and painted faces and bodies. Some of the costumes represented birds and animals. It is believed that on the platforms of the north stairway of the Kukulcán pyramid, “El Castillo”, in Chichén Itzá, comedies were performed. Because of its similarities to theater as we know it, with makeup, costumes, scenography, and a stage, we can say that this was the base of Maya theater. There were religious processions, songs, comedies, dances, and representations that indicate a rich scenic life enjoyed by the Maya before the arrival of the Spanish, with humor and laughter, in which the local community engaged with a common purpose. 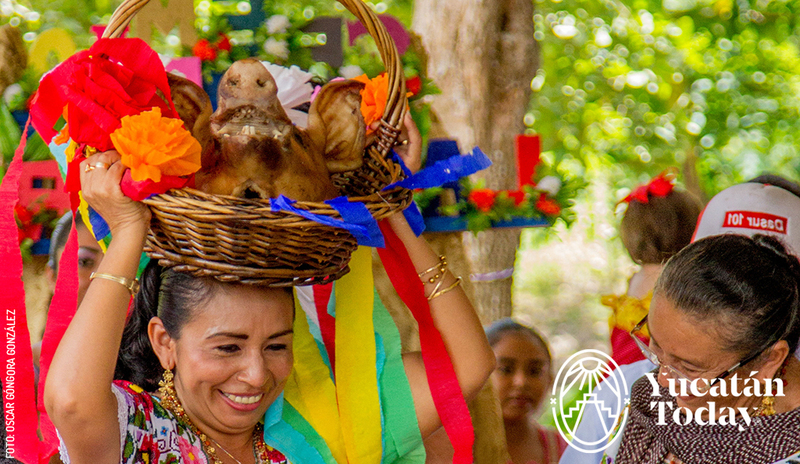 Today some of these customs are still carried out, transformed into dance and representations that unite the pre-Hispanic traditions to Christian religion; such is the case of the “Cabeza de cochino” (pig’s head, known in Maya as Pol kekén – Pol=head, Keken=Pig), which can be seen today as a dance at the “vaquerías” and other popular events in Mérida as well as smaller towns. Originally they were performed with a deer’s head, but with the arrival of pork with the Spaniards, it was changed. This performance begins with the preparation of the pig’s head, adorning it with narrow ribbons of various colors, and other elements that symbolize food. Elder women dance around the person carrying the pig’s head on a tray on his head, usually a man. The owner of the pig also participates, as the head of the family, who will guide the pig during the procession with a rattle, and a gourd filled with corn and water to feed him when he tires. The history is simple: a family that has raised a pig takes it to the market to sell in order to buy clothing and shoes, and other necessities. It has four moments: the departure from the house of the owner, the walk to the market, dancing on each corner, and finally the tour to the house of the new owner. To the rhythm of live “jarana” and “charanga”, the person carrying the pig’s head dances among the people. The different colored ribbons are taken by each of the jarana dancers, in this way representing the union of the community. The costume is “hipil” for the women, and “guayabera” and white pants for the men. This dance/theater is very popular and demonstrates the integration of the community, participating in the sale. There are many similarities with the “baile de las cintas” (ribbon dance), in which a pole is placed in the center and the ribbons are braided around it and among the dancers. You can see some of these dances at the Vaquería on Mondays at 9 pm outside the main doors of the Palacio Municipal, on Calle 62 between 61 and 63, Centro.